Crack in polished concrete floor. Crack in polished concrete repaired with MatchCrete™ Clear. Exposed aggregate repaired with MatchCrete™ Clear after. 1. Meet with the floor owner to determine the ultimate floor repair goal and desired outcome. In some situations, it may be better to repair cracks and defects as they are. In other situations, it may be better to open them up with a diamond blade. While no repair material can make cracks and defects disappear, with MatchCrete™ Clear you can make these areas much less noticeable. MCC is a semi-rigid material that should not by used in high movement joints and cracks. Always determine the underlying cause of the concrete failure as a guide for the best course of action. READ AND UNDERSTAND ALL SDS SHEETS AND PRECAUTIONS BEFORE USING THIS MATERIAL. FOR PROFESSIONAL USE ONLY BY TRAINED APPLICATORS. Always use gloves and safety glasses. Do not get this material on your skin. 2. Prepare floor cracks, joints, spalls, and pop-outs in accordance to standard application instructions. Concrete, substrate, and all materials should be completely dry. 3. Sand selection: By altering the sand used with MatchCrete™Clear, different color results can be achieved. Some experimentation may be required to get the desired result. Start with dry silica sand and a dusting of concrete dust as the material cures. Other types of sands such as concrete sand, colored quartz, and flint may be used. Choose the best combination to match your floor. Any type of sand you use should be hard, free of dirt and organic material, and completely dry. 4. Color: MatchCrete™ Clear will cure to a crystal clear appearance. Small amounts of powdered concrete colors such as Solomon Colors may be mixed in with the sand as needed. Experimentation to determine the best sand and color combination will be required to get the desired effect. 5. Mixing: Apply MatchCrete™ Clear from a properly assembled dual cartridge with directly to the repair area. Use silica sand to stop material from flowing away from the repair area. Always apply material and add sand as you go. Do not pre-place the sand and attempt to flow the material into the sand. 6. Use a margin trowel to finish the repairs. For a flush repair, leave the repairs slightly higher than grade. The excess material will be honed off later. Dry concrete dust may be added as the material cures for blending purposes. 7. Allow the repairs to fully cure for 30 – 90 minutes depending on the temperature and the size of the repair before honing or grinding. Allow to cure for 24 hour before polishing. Will MatchCrete™ Clear change color in direct sunlight over time? MatchCrete™ Clear uses a special aliphatic polyurethane formula that resists UV color change. Color change is possible if the sand or pigments added to the repair change color over time. Can I repair hairline cracks with the needle tip mixers? 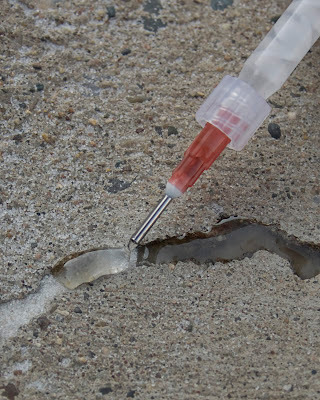 Yes, MatchCrete™ Clear is compatible with Roadware Needle Tip Mixers and accessories. What kind of color can I add? For most repairs, use colored sand or quartz to match the desired color. Small amount of powdered concrete pigments may be blended with the sand prior to mixing with MatchCrete™. Can I add concrete dust to MatchCrete™? You can add a limited amount of concrete dust to MatchCrete™ Clear as the repair cures to get a desired appearance. It is best to experiment and test before use. Can I mix and match colors? Absolutely! Mixing and matching colors and sand to get just the color and texture you want is what MatchCrete™ is all about. Can I add too much color? Yes, use just enough color needed for the job. Adding too much powdered color or cement powder to the sand can hurt the performance of the repair. Can I leave the repair clear? Yes, adding sand and color is optional. You can use the material as is for a clear effect.